In some cases you may want to allow your customers to choose a shipping method most suitable for them. That might be, for example, Express Shipping and Regular Shipping. Let's convert current domestic shipping configuration to produce express and regular shipping options. Adjust Express Shipping child rules' rates to something you feel appropriate for express shipping. If you would go to the checkout page and test it with New Zealand specified as the destination, you would notice that it always shows Regular Shipping. By default, a rule "captures" an order if it matches rule conditions, preventing it from being processed by the next rule. Since Regular Shipping has no conditions it captures any orders. Usually, that's appropriate behavior but in our case we need to handle order with two rules at the same time, with both Regular Shipping and Express Shipping. To achieve that go to the Conditions section of the Regular Shipping options and uncheck Capture checkbox. 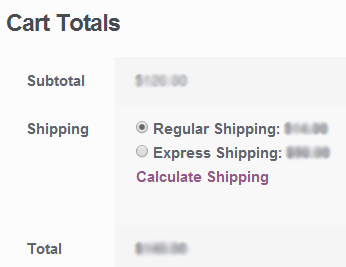 After capture disable there is an Express Shipping rate always appears on the cart page. Moreover, shipping cost is a sum of Regular Shipping and Express Shipping rates. That's in turn happening because, by default, all produced rates are summed together. Instead, we need to show all produced rates as they are to the customer. To achieve that go to the Domestic Shipping, locate Child rules calculation and switch sum to all. Also, we need to do the similar thing for the root level. There is the Show sum of produced rates to the customer option at the top of the rate table. Switch it to all too. Now, we've got it showing two delivery options to the customer. Congratulations! Crash course is over. You have a working configurations which you can expirement with. To get a deeper understanding of the system flow read the How It Works chapter.